Separating from your spouse is a tough decision. It’s an emotional decision. You need a plan. If you are the one leaving the marital home, you may not be able to return. We have prepared this paper for you, our clients and potential clients to help you create your plan. If you would like to have this information for future reference, download our Preparing to Separate ebook. Videotape and/or photograph the inside and outside of the house. This will be helpful if there are questions later about the condition of the property when you separated. Even if you remain in the marital home, document the condition of your property as close to the date of separation as possible. If possible, videotape the condition of the home as you leave or immediately after your spouse has left. Videotape and/or photograph all furniture and other personal property items you are leaving in the home as well as the ones you are removing. This will be helpful if the existence of or condition of an item later becomes an issue. Also, this will help you in completing an Equitable Distribution Affidavit. Make a list of all personal property. For each item, try to include information about when you got it, how much you paid for it and how much you now think it is worth. It will be much easier to begin preparing your equitable distribution affidavit while you are able to look at all the property rather than trying to reconstruct it from memory later. Items such as silverware, collectables, jewelry, electronics, etc. should be set out on a table or otherwise displayed so that they can be easily photographed. List and photograph items that you are removing from the home. If an item has damage or other factors that affect value, be sure to note or photograph them to avoid claims that you caused the problem after the date of separation. Take important documents such as tax returns, bank statements, investment account statements, receipts, etc. or make copies of them before you leave. Any document that shows the existence or value of an asset may be important. Scanned or photocopies of all important documents will be sufficient in most cases. Do not forget items that may be stored in your attic, basement, garage, outbuilding or shed. Inventory your children’s property. Unless you and your spouse agree that certain items will be treated as belonging to the children and not counted as marital property, the children’s items will have to be valued and distributed to one of you. Do not forget Christmas decorations, scrap books and family photographs. These may not have a great deal of monetary value, but they have significant sentimental value. These items will need to be divided in your equitable distribution proceeding. However, if you take possession of them pending a division, you can make sure that they remain unharmed. Items that you leave in the home when you move out are still subject to being divided between you and your spouse. The fact that you leave them behind is not a waiver of your rights. However, if there are items that you definitely want to receive, you should probably take them with you when you leave. If your spouse remains in the former marital home with minor children, you should not take items which are necessary for the children. You should try to create as little disruption to the children’s lives as possible. If you are not taking the home computer, be sure to print or copy any information that you will need. An even better idea is to make a complete back-up of the home computer using an external hard drive or another computer. Take with you any vehicles that you drive and are not necessary for other members of your family. If your spouse will have custody of the children, you should not leave your spouse without a vehicle. If there is only one vehicle owned by the family, then discuss with your attorney who should maintain temporary possession. Also check with your automobile insurance agent. Be sure they have your new address and ask if your spouse can cancel your policy. Do not cancel your spouse’s policy or drop your spouse from your policy without first discussing this with your attorney. Make appropriate plans for any pets or other animals. If your spouse has not been the person to care for animals you should take your pet when you leave. On the other hand, if your pet belongs to the children, the pet should stay with the children. You should not return to the marital home without the permission of your spouse. If your spouse indicates in any way that she or he does not want you to return, then you can be arrested for trespassing if you return without permission. If your spouse does not agree for you to return, you will need to obtain an Order from the court to allow you to return and obtain specific property or have property reviewed by appraisers. As close as possible to your date of separation, you should begin your list of property and debts as well as your list of income and expenses. Forms are available on our website to assist you with gathering the necessary information. You should not create additional significant debt before your departure or leave an opening where your spouse could create additional debt. If there is an equity line or line of credit loan from which your spouse can withdraw funds, you should contact the bank and discuss this with them. Many banks will convert the account to one which requires both parties’ signatures before any new withdrawals. If possible, pay off and close out any credit card accounts prior to the separation. If you are not able to pay off the card, contact the company and determine whether there is anything that can be done to prevent additional charges. If your spouse routinely makes charges on any local accounts, you may want to contact the creditor and let them know that you are not responsible for his or her charges from this day forward. In other words, review all opportunities your spouse would have to create any debt which would be in your name or secured by your property. Take measures to minimize your risks or prevent this from happening. However, do not leave your spouse without the means to obtain necessary items. You should make sure your spouse cannot access bank accounts which are solely in your name. Joint accounts should either be frozen, divided equally or if you believe these options are not best for your situation, discuss it with your attorney. Also, do not simply withdraw half of the joint checking account and leave all of the un-cleared checks to come out of your spouse’s half of the account. If your spouse has a steady pay check or other significant sources of funds and you do not have a pay check or other funds, then it may be appropriate for you to withdraw the entire joint account. You should discuss your plans with your attorney to determine the best way to handle these assets. If you own life insurance which has a cash value, you should ask your agent if your spouse can cash in the policy. Likewise, you should not cash in any policy without discussing this with your attorney. IRA and other retirement plans which specify a beneficiary need to be reviewed. Most of them will allow you to change the name of your beneficiary from your spouse to your children or other beneficiaries. Some will require that your spouse sign a document to make this change. You need to go ahead and find out what will be involved and make sure that your spouse cannot make changes you are not anticipating. If you and your spouse own a business together, your spouse will have equal access to it after your separation. Depending on the nature of the business and the nature of your spouse’s involvement, this can create a significant problem. If you believe your spouse may take any inappropriate actions regarding company funds, records or other property, then you need to make the appropriate safeguards. If your spouse is the person primarily in charge of the business, then you need to make sure you obtain copies of business related documents which will be necessary for purposes of valuation of the business. Neither you nor your spouse should take any actions which will diminish the value of the business. Fill out a change of address form at the post office. Also notify all creditors whose bills you expect to pay. If your housing situation is temporary, you should obtain a post office box address until you have a more permanent physical address. Do not change any utility or other services to the former marital home without discussing this with your attorney. You should not leave your spouse in an overly difficult situation. If the services or utilities are in your name and you will not be the responsible party to pay them, you need to contact the provider and find out how to change it into your spouse’s name. If you are providing the health insurance, do not cancel your spouse’s coverage. If your spouse is providing the health insurance, you should contact the company and determine whether or not they will let you know if your spouse tries to cancel your coverage. Unless you can obtain your health insurance independent of your spouse, you may want to offer to pay your spouse for the continued coverage until the divorce. Be aware of all outstanding bills that will come due around the date of your departure or shortly thereafter. You need to either make provisions to get these bills paid or present them to your spouse and request payment. 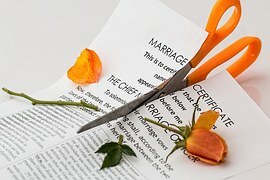 Do not take legal or financial advice from your spouse during your separation. You and your spouse cannot be represented by the same attorney. Do not sign any legal documents unless you understand fully the legal effect of that document. Your friends will be sympathetic and they want to help you. However, your situation is unique and their experience may not be what is best for you. Let them console you, but get your legal advice from a lawyer. Be careful about websites such as LegalZoom and other sites that sell legal forms. For the most part, these websites do not provide legal advice and the forms may not be guaranteed to comply with North Carolina law. If you want legal advice about separating from your spouse in North Carolina, you need to talk to a lawyer licensed to practice in North Carolina. Facebook, Instagram, Twitter and other social media sites are great sources of information, connections and entertainment. Email and computers have greatly simplified our lives. However, these resources have risks. It is a bad idea to air dirty laundry or bad-mouth your spouse on these sites or via email. Why? It’s a permanent record. Once it’s out there, you can’t take it back. Things you say on Social Media sites CAN be used as evidence against you. If you have children, saying nasty things about the other parent can seriously impact your chance of getting custody. Emails can be requested in pre-trial discovery. If do not want certain information to have the potential to become public, email is not the best form of communication. Although email communication with your lawyer is confidential and privileged, if you include other people in those emails, they may lose their confidential nature. Be very careful about Reply All in an email. Some attorneys simply forward emails between the two attorneys to their clients. If you accidentally Reply All, you will send your email to the opposing attorney. At Irvine Law Firm, we take the confidentiality of your communication with us very seriously. Generally, we will forward copies of emails to you and you alone, rather than simply copying you with our communications with other attorneys. We think it is the smart way and the ethical way to handle your communication with us. We also offer the option of a secure client portal for confidential communications. If your spouse has passwords and login information to important sites such as online banking or credit card sites, you should change those passwords immediately when you decide to separate. Save your important documents in a cloud-based directory that is password protected. The answer to this question depends on how complicated your situation is and how much you and your spouse agree or disagree. If you and your spouse have agreed how to divide your property and there are no complicated legal issues involved, one of our online separation agreements may be all that you need. If you decide to represent yourself, Irvine Law Firm’s Advice by Phone or Advice by Email offers an affordable and convenient way to obtain the professional advice you need and the peace of mind you want. Having your questions answered will give you the confidence you need to represent yourself. We understand how difficult it is to decide when separation is right. Once you make the decision to separate, let us help you through the transition. If you are ready to take the next step, contact Irvine Law Firm.